It has been well-documented for a long time that Google makes about 400 changes to its core algorithm every year. From testing user responses to layout, font size, and ad placement to determining the effectiveness of Knowledge Graph answers and local listing placements, Google is creating quite the moving target for SEOs. We've also known for a while that without an effective SEO data aggregation platform, like seoClarity, the larger the organization and site, the more swamped SEOs become and the less productive they are. The problem, of course, is a matter of priority and a matter of scale. 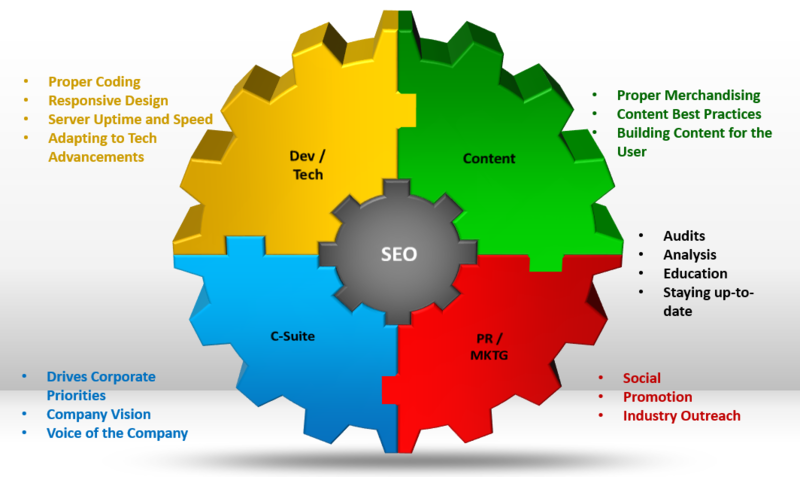 And even with an SEO platform, SEOs may find themselves with a glut of data and possible activities resulting in a major case of the Paradox of Choice – too many choices equals no choice; or in the case of SEO activities, too many tasks result in paralysis. The first is a challenge we all face, but a simple shift in perspective can really help. If you build your task list as simply a way of addressing each nuanced change that Google makes to their algorithm or each revelation coming out of John Mueller's Google Webmaster Hangout, you will most definitely run into a problem of scale. 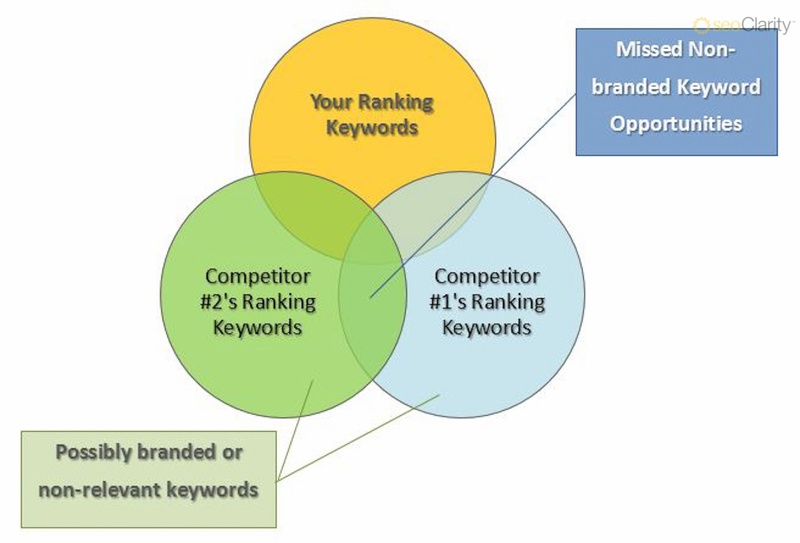 However, if you take advantage of the framework for Search Experience Optimization that I describe below, you'll be able to prioritize your activities more effectively. The second problem, the problem of scale, is a reality for any organization of any size. Your bottleneck will always be the number of people available to work on your prioritized task list. (I know. "Duh!") Does this necessarily mean that you should go on a hiring spree and increase the size of your SEO team? Not necessarily. Keep reading because I'd like to change your perspective on scale as well. We've been developing the framework for Search Experience Optimization over the past few years, and we've seen companies use it with much success. As a framework it not only helps you understand how to think about search, but it also gives you a perspective on how to prioritize your efforts. Adopting the Search Experience Optimization definition of SEO over Search Engine Optimization allows your organization to shift the focus from the search engines onto the users. It sounds simple, but this small shift in perspective will align your organization with the intent behind all of Google's algorithmic changes, which is to rank sites with great content on fast and responsive pages. How do you prioritize your organization's efforts in a Search Experience world? As you can see in the image below, the foundational element of our Search Experience framework is Usability. We know that great content ultimately drives conversions for your site, or it educates or entertains your users, but if your pages load slowly or aren't compatible with their mobile devices, you're not providing a delightful experience. 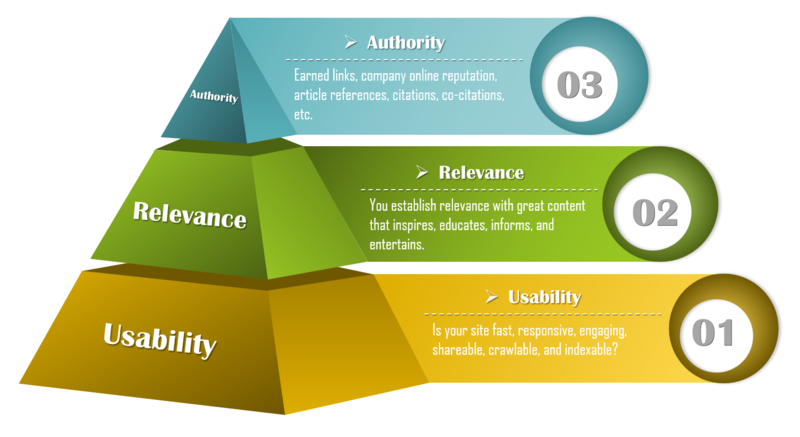 From that foundation, you can build a great content marketing strategy that drives your site's Relevance. Site content should fulfill the promise made at the search engine level by delivering content that is relevant to the query and ultimately meets the needs of the user. We offer tools that allow you see what conversations and questions there are around specific queries and help you determine what kind of content best serves those users. In the past, SEOs have been too focused on attracting links in order to rank better, but we know that the best sites attract links and thereby establish their Authority naturally. We can help you maximize your internal link flow and identify link partnership opportunities using our Wisdom of the Crowds approach, but ultimately, links and social signals are the by-product of great content and building relationships with your users. If you're just starting your site, this is a very easy framework to plug into and to begin prioritizing your efforts. Build a solid foundation on which your awesome content can live. And then invest heavily in promoting your brand by wowing your customers. But if you've been around for a long time, how do you use this framework to prioritize your embedded technical issues? How do you use it to know how toxic those links you bought a few years back are to your Authority? What about all of that keyword-stuffed content? Where do you prioritize fixing that? If you have a history of displeasing users on your site, the best possible place to see how to prioritize your activities is in your analytics platform. Which pages have your highest bounce rates? Can you tell if this is because your content doesn't fulfill the promise that your keyword relevance made? Or is it because your page loads too slowly? By looking at your analytics, you can see which aspect of your site is the biggest offender and which aspects of your site are the least pleasing to your users. Start here, because Google is most interested in making sure the users they send your way are happy. Depending on the scope of issues you'll need to tackle on your site, the more you'll see value in the next section on democratizing SEO. The most important aspect of Search Experience Optimization is that the efforts are democratized across the entire organization. In the most successful online organizations, developers understand the best coding practices and the foundational requirements for crawlability and indexability. Systems administrators know how to optimize their servers to create the ideal crawl environment, and they know the warning signs to look out for negative SEO attacks. Content teams are given the tools and information to create the best, most-impactful content. PR, Marketing teams, and even the C-Suite understand the impact of their efforts and can focus on building the best brand in their industry. This is the essence of democratizing SEO and scaling SEO efforts across large organizations. As an industry, we can't afford to have all efforts related to SEO cloistered into a single department, because not only does the entire site impact SEO, but so does a company's brand building efforts. If Search Experience Optimization becomes part of an organization's DNA, including its traditional marketing efforts, social media presences, coverage in the media, product line, customer support efforts, and so on, everyone becomes invested in its online success. Otherwise, SEOs will find themselves where they have in the past - one person or a team of people trying to retroactively "optimize" content, coding, navigation, link equity flow and external links. 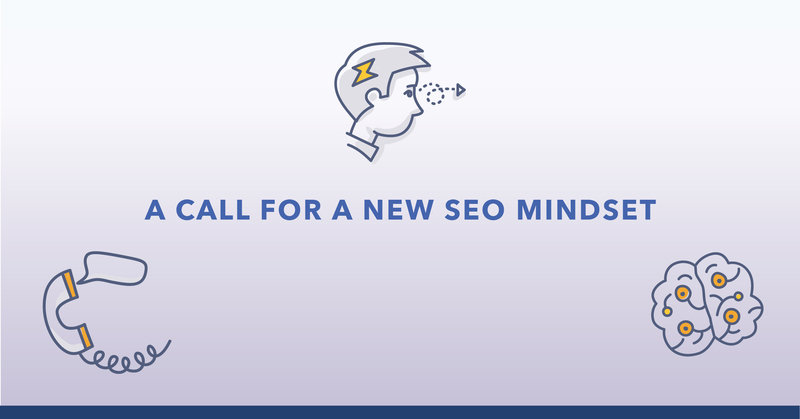 Rather than the frenetic and tactical approach that we've used in the past, democratization combined with the Search Experience Optimization framework will allow SEOs to be infinitely more strategic and effective. Stay tuned as we explore further the Search Experience Optimization framework in the coming weeks. Keith Goode is the head of SEO at IBM. With more than 10 years of experience in SEO, his expertise spans global enterprise SEO and enterprise technical SEO, and these fuel his fondness for SEO education and the spreading of SEO Consciousness throughout organizations. Additional, he served as Chief SEO Evangelist at seoClarity in 2015 - 2016.